When you call a tiny space home, finding pieces of furniture that pull double-duty feels like a major win. 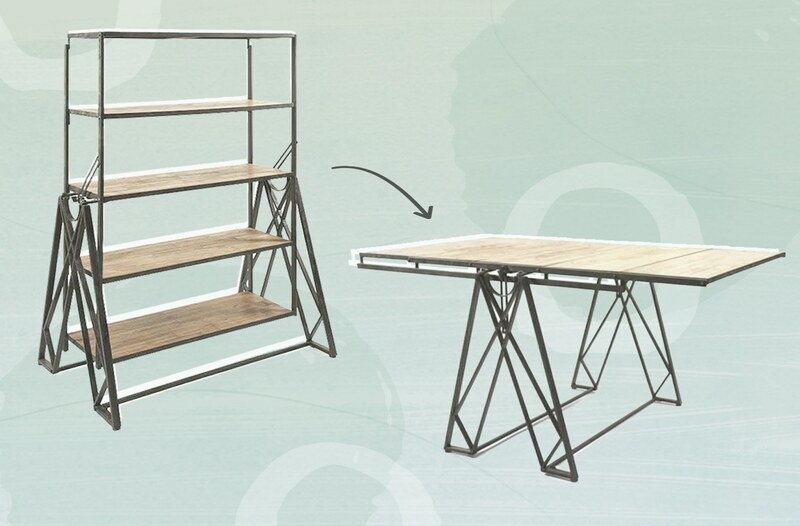 So if the surface area of your abode forces you to make tough decor decisions, this bookcase-slash-dining table will let you transform a living room easily from bookworm-chic to dinner party-ready. It’s not magic, though it sounds like it is; the shelves are designed to stay level as the unit’s converted, so their contents wind up on your tabletop in one piece. In the product description, the company adds that you can also use the bookshelf to display your carefully-made hors-d’oeuvres or potluck contributions during the mandatory pre-dinner socializing if you’re feeling extra-fancy. Then, just impress all your guests with the transformation party trick. If you’re dwelling in a shoebox-sized space, you can fold your clothes like this to save a ton of room, and purchase this genius dish drying rack.